Since last month’s Church Multiplication Vision Festa I have been encouraging many people. A president from one mission organization was very inspired by my words “This was the best Vision Festa ever and I believe possibly a key watershed event.” Let me share with you my impressions, thoughts, and feelings about Vision Festa. The atmosphere was refreshingly extra-ordinary. Instead of workers discouraged or doubtful this event was full of faith, belief, and hope in God, His Gospel and His mission for Japan. 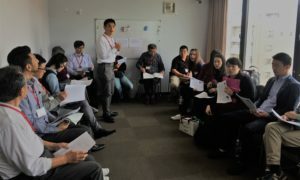 The Church Multiplication Vision Festa started in 2014 when a small group of Japanese leaders hand-picked 65 additional leaders to begin a movement for church planting multiplication. Over this time it has been growing and building momentum while meeting in several regional areas influencing those local leaders with new vision and ideas. Vision Festa began with an understanding that the task in Japan can never be done by addition, only the multiplication of churches. Many leaders are catching the vision for multiplication of churches. In my over 30 years in Japan, I have never been among Japanese leaders and workers in a more positive, faith-filled atmosphere. It was infectious, contagious, and hopeful for the entire church in Japan. Well, what about this event made it a defining moment in the church in Japan? Centering on God and His Might – Throughout Vision Festa the message was clear. God loves Japan and has a hand on Japan. God is answering prayer and God assures us that the harvest is plentiful, it is about God and what he desires for Japan. Tackling Practical Obstacles – If we have a vision to establish 50,000 new churches, we will need 50,000 workers trained and equipped. In addition to formal Bible school and seminary, Vision Festa also considered informal training like seminars and study programs (this is CPI’s niche) and non-formal training like discipling, coaching and mentoring. 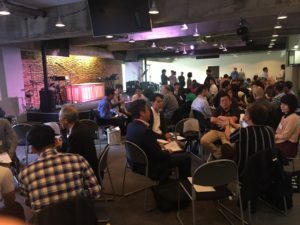 Building Relational Networks – Vision Festa has grown into a broad-based, evangelical movement of pastors, church leaders, and lay-people from various denominations, independent churches, and ministry networks from all over Japan. For more details on the what of Vision Festa see this additional article. So you can see why this excites me, a group of Japanese believers who each desire to be an obedient disciple of Jesus. These are not people committed to quoting the Great Commission, not memorizing, or teaching or preaching the Great Commission but simply obeying Jesus’ Great Commission command to make disciples of all nations. It is so hard to express my feelings about this event, especially how God touched me and the implications for my future. God shocked me by the faith and enthusiasm of so many Japanese. They encouraged me by their admirable faith and their praiseworthy commitment to the Kingdom of God. Their dependence on God and His desire to reach Japan, His vision, and His equipping to enable us in His task. God also challenged me with this faith-filled atmosphere. God stirred me about my unbelief and my doubts about multiplying churches in Japan. I came away personally challenged whether I was indeed committed enough. God also forced me to check my life trajectory and re-calibrate. My mission and role is to ignite, catalyze, and accelerate church multiplication in Japan. To support people in church multiplication through CPI, Vision Festa, and other networks will mean a continually refocusing of my energy and prayers. 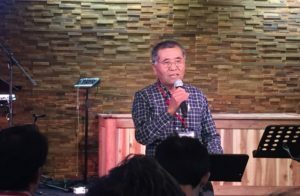 I wrote over a year ago “that momentum seems to be growing church planting and multiplying movements throughout the entire country of Japan.” Now I really know there is momentum. Recently I engaged a key church planting leader and he agreed with my assessment that this event was the most significant sign in the last 10 years for church planting multiplication. From this faith-filled event has come even more commitment to multiplying churches in Japan. A sense of urgency is growing. Comments from the evaluations included many who wanted to plant more churches. One attendee said they would like to start a church in their own home with their family. Others took lessons learned and desired to establish a healthy church that would multiply churches. We will not have to wait an entire year for the next Church Multiplication Vision Festa as one is scheduled for July 8-9 in Ochanomizu Tokyo. Begin praying for that event and for the leadership team fostering this movement. Pray against the spirit of doubt because unbelief like vision is contagious and a cloud of doubt can neutralize all that has happened. Spiritual resistance and warfare will arise against these Japanese Christ-followers who believe. But pray their relationships would have ever-growing success toward a nationwide church planting initiative. This festival of vision for church multiplication in Japan will require more faithfulness to God and His vision for Japan. Pray all would continue a long-term obedience linking arms as they move forward. Thanks for praying for our financial support shortfalls. We have been encouraged by people increasing their regular support and others with special gifts. Though there is a lot of encouragement, we continue to several hundred dollars short each month. Please continue to pray for this need and whatever you can give now – or maybe before the end of the year – would be appreciated. Japan CPI Fund: These funds support special projects to support church planting mobilization and training. Japan CPI fund is at Converge https://converge.org/give/31256. See more information at www.GOspelRest.com or see us both on Facebook.